Home » Blog » Was that the best Transportation Trivia Night yet? Was that the best Transportation Trivia Night yet? Transportation Trivia Night is becoming a well-loved tradition around here. It always seems impossible to top the previous event, but last night may take the cake as the most successful Transportation Trivia Night to date! Over 120 contestants, well-versed in the wonkiest of transportation facts, joined us at the Radio Room to duke it out for the third round. Everyone’s favorite traffic engineer, Peter Koonce, was back as MC and we had a whole new batch of questions that were challenging even the most prepared players and previous winners. Team I Can’t Believe It’s Not Chamois Butter took away the best team name prize, an awesome gift bag from Bikeasaurus. 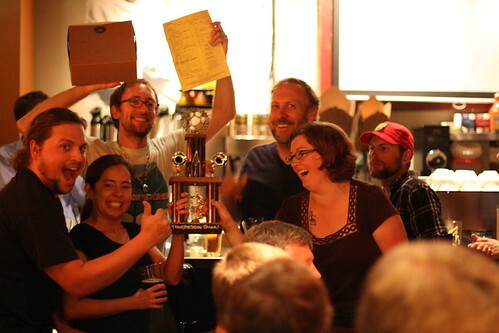 The team that won it all with 20 points, Maxx Tracks in Your Face, received the coveted Transportation Trivia Night championship trophy, and gift cards from a slew of Alberta businesses: Random Order, Bollywood Theater, Halo Thai, Salt & Straw, and the Community Cycling Center. For those of you who couldn’t make it out, or want to revisit the questions you got wrong/brag about the questions you got right (no post-event heckling! ), the entire PowerPoint is located here. The best part of it all is that the entire evening was dedicated to raising money for Bike Club, our after school, earn a bike program for 4th-6th graders from families living on low incomes. We had a generous business sponsor, Kittelson & Associates, who matched the first $500 donated by the crowd. In an AMAZING turnout, we raised $1262 in about half an hour, which more than doubled the original match. In addition, Radio Room donated 10% of their proceeds from the evening, and we came away with a total of $3,818, all of which will go toward funding two Bike Clubs this fall. Thank you all so much for coming – we can’t wait for the next round! Check out photos from the evening below and start studyin’!